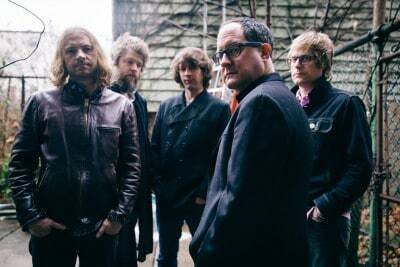 Rising out of the ashes of Lifter Puller in 2004, indie rockers The Hold Steady have been lighting up the music scene in Brooklyn since their brilliant first album ‘Almost Killed Me’. Ten years on they’re joining us in Manchester on the latest leg of their tour supporting new album ‘Teeth Dreams’ and have built up a devoted following on this side of the pond over the years. As a result the venue is busy if not completely sold out in anticipation of their arrival. Having been suitably warmed up by support act The So So Glos whose punk style is energetic enough to get everyone in the mood, it’s time for the band themselves to grace the stage. When they finally arrive they waste no time in cracking in to ‘Positive Jam’, the opening track from their début that is essentially a mission statement. Gradually building heavy guitars and featuring such lines as “I got bored when I didn’t have a band so I started a band, man”, it’s the perfect intro to what proves to be a rip-roaring set that includes songs from all of their five albums, ensuring everyone’s happy and playing all their certified crowd-pleasers too. Follow-up song ‘Stuck Between Stations’ has everyone jumping and singing along, and lead singer Craig Finn is his usual highly energetic self, dancing and gesturing frantically at the crowd at every opportunity. The days of former keyboardist Franz Nicolay, who left the band in 2010 before their fifth album ‘Heaven Is Whenever’, may be remembered fondly and indeed spawned their masterpiece album, 2006’s ‘Boys and Girls in America’, but with the addition of second guitarist Steve Selvidge they have added a new dynamic to replace the old, and the songs still work just as well. Proceeding to roll through ‘I Hope This Whole Thing Didn’t Frighten You’ and ‘Ask Her For Adderall’ without pausing for breath, the next real treat comes in the form of ‘Knuckles’, a song that doesn’t make many appearances on their setlists but has been wheeled out to make this show feel particularly special. It’s an infectious and entertaining one, Finn’s lyrics are consistently amusing and there’s even a pause in the song for everyone to reminisce about Sunny D, which makes an appearance in said lyrics. By the time the song is over, the band have managed to do what they’re famous for, which is to unify the crowd in their enjoyment of the show they’re put on, full of energy and harking back to the days of Bruce Springsteen and Tom Petty, the heartland rock giants of America. We move on to new heights with wonderful performances of two crowd favourites, ‘Sequestered in Memphis’ and ‘You Can Make Him Like You’, the former is suitably euphoric and Finn’s lyrics are just as amusing and infectious as they are on record. After the band play the first track from fifth album ‘Heaven Is Whenever’ in the shape of ‘The Sweet Part of the City’ we’re treated to the always brilliant ‘Chips Ahoy!’ and a particularly brilliant performance of ‘Spinners’ with guitarists Steve Selvidge and Tad Kubler really coming in to their own with a series of brilliant, almost warring, solos. Nearing the end of the main set as we are, the band play personal favourite ‘The Weekenders’ to chill us all out before getting us all worked up again with the best performance of the night in the shape of the classic ‘Your Little Hoodrat Friend’, which blows us out of the park and has the whole crowd bouncing in a wave of euphoria. The band’s energy certainly emanates out in to the crowd, and it’s hard not to move along frantically even if you’re unfamiliar with their songs. They end the main set with a special performance of ‘Stay Positive’ dedicated to a fan at the show recently out of hospital and at his first show after recovery. This gives it an added resonance and it’s hard not to appreciate the gesture by the band, who have always prided themselves on being in touch with their fans, or The Unified Scene as they’re known. After leaving the stage briefly they return for another highly energetic and perfectly executed rendition, this time of ‘Massive Nights’, a gem that packs a lyrical punch as well as a musical one, with pounding drumbeats and a delicious bassline. The song ends with appreciation for The So So Glos, who are promptly invited on stage for an ensemble performance of ‘American Music’, a Violent Femmes cover that gets the crowd together for one last time, as Finn grins and implores fans to join in. This show is one of those rare experiences where everyone, either at the front or the back, is joining in, moving and bouncing along, feeding on the enthusiasm of a band that clearly loves playing live and relishes the fact that people are still coming out to see their brand of unabashed, old fashioned rock and roll, arguably more enthusiastically than ever. It’s been ten years, and here’s to another ten.